Besan ke Ladoo: Besan ke ladoo or besan ladoo are one of the popular ladoos often made during festive occasions, in India. 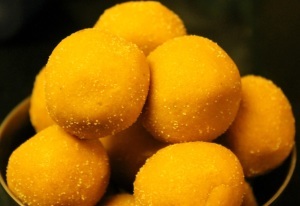 Gram flour or besan roasted with ghee in a kadhai, flavored with sugar and cardamom and shaped into tight round balls. Besan ke ladoo are decorated with almonds or pistachios. Heat the ghee in a thick bottomed pan, on medium heat. Stirring continuously, roast the besan for about 10 minutes or till you start getting a nutty fragrance from the besan. Continue to roast on a low flame, stirring continuously, till the colour of besan has changed and ghee starts separating from the besan. Keep stirring so that the mixture does not stick to the bottom of the pan and burns. Add in the chopped cashews or almonds and green cardamom powder. Remove the besan mixture from heat. Keep on stirring to beat out the heat from besan mixture, till the mixture is hot enough to handle with your hands. Make small golf sized balls from the besan mixture. Besan ke ladoo are ready to be served. Serve the ladoos at room temperature. Besan ke ladoo can be stored, for a week, in an airtight container. if you are not able to make the ladoos due to the mixture being too dry, then add 1 or 2 tbsp of melted hot ghee in the mixture and mix well. if you are not able to make the ladoos due to the mixture being too smooth and does not hold shape then let the mixture cool and make the ladoos. If the mixture is still not holding the shape, then refrigerate the mixture for 20-30 minutes. After refrigerating the mixture becomes firmer and then you can form the ladoos easily. If you have any queries regarding the Besan ke Ladoo recipe, please leave a comment.